Enable AirPlay on your iPhone to stream data, or even the entire screen, wirelessly between your phone and other compatible devices on the same Wi-Fi network. Using AirPlay on your iPhone requires an AirPlay receiver. This can be a third-party AirPlay-compatible speaker system, Apple TV, or an Airport Express hub, for example. Configuring AirPlay on an iPhone is really easy. These steps apply to iOS 12 down through iOS 7, so be sure to follow the steps that pertain to your iOS version. Learn how to find your iOS version if you're not sure which directions to follow along with. 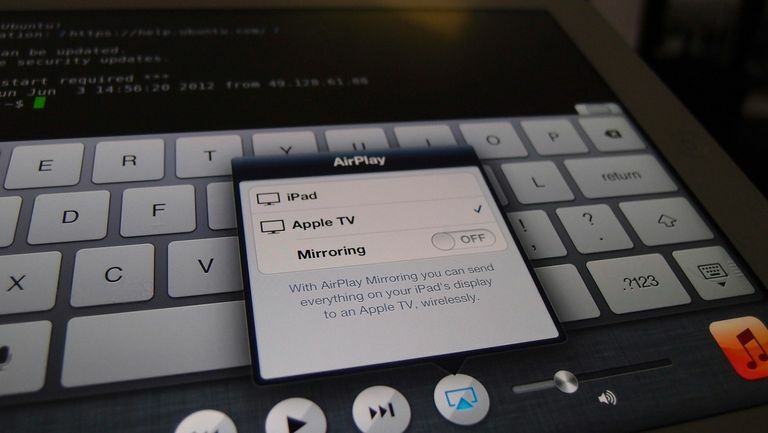 Make sure that both the iPhone and AirPlay receiver are powered on and connected to the same wireless network. iPhone X & iPad iOS 12: Swipe down from the upper-right corner of the screen to see the Control Center on iPhone X or an iPad running iOS 12.
iPhone 8, or iOS 11, and earlier: Swipe up from the bottom of the screen to access Control Center. iOS 11 & 12: Tap-and-hold the music control area and then tap the AirPlay button on the upper right-hand corner of the new menu. Skip down to Step 5.
iOS 7–10: Skip to Step 4. Tap the AirPlay button to get a list of all the AirPlay devices you can connect to. Tap a device to connect to it over AirPlay. If you're connecting to an Apple TV that isn't on the same Wi-Fi network as your iPhone, enter into your phone the code displayed on the TV. On some devices, you might need to tap Done to establish the connection. With AirPlay enabled, and with the iPhone's built-in Screen Mirroring feature, you can show your phone's screen on your Apple TV. Tap Screen Mirroring or AirPlay Mirroring, depending on the iOS version that's running. Enter into your iPhone the AirPlay passcode displayed on your TV, if you see one.